Diabetic kidney disease (DKD) is a major cause of ESRD. Management includes prudent BP and glycemic control, nutritional counseling, and lifestyle modifications, including exercise, weight loss, and smoking cessation. Renin-angiotensin system (RAS) blockade using angiotensin-converting enzyme (ACE) inhibitors or angiotensin-2 receptor blockers (ARBs) is beneficial in regressing albuminuria and preserving kidney function. Mineralocorticoid receptor antagonists (MRAs) reduce proteinuria. Their role in preserving kidney function is under study. A comprehensive perspective for treating patients with DKD includes therapy that minimizes cardiovascular risk and addresses other major diabetic complications, including coronary artery disease, congestive heart failure, cerebrovascular disease, peripheral artery disease, retinopathy, neuropathy, gastroparesis, and dyslipidemia. Consequently, DKD management is dependent on patient-specific factors, considering cost, adverse effects, and convenience of therapeutic regimens measured against anticipated benefits (Figure 1). We present a case to highlight diagnostic and treatment challenges in a patient with type 2 diabetes mellitus and CKD. 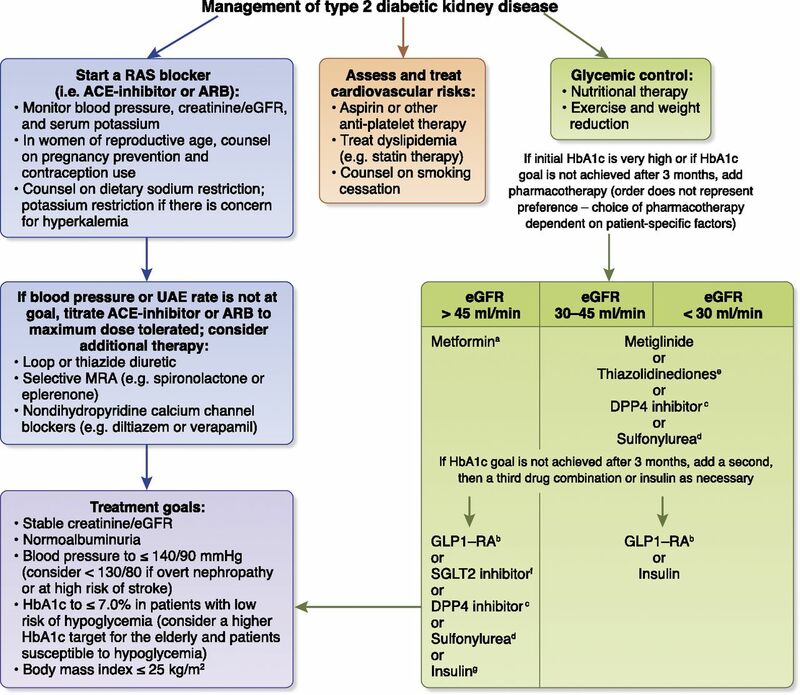 Management of type 2 diabetic kidney disease. aMetformin can be continued in patients with eGFR=30–45 ml/min per 1.73 m2 if it was started while their eGFR was >45 ml/min per 1.73 m2 with dose adjustment and monitoring of renal function. bLiraglutide does not require renal dose adjustment for low eGFR. There are no data on the use of a glucagon-like peptide-1 receptor agonist (GLP1-RA) in conjunction with a dipeptidyl peptidase-4 (DPP4) inhibitor or sodium glucose cotransporter-2 (SGLT2) inhibitor. cLinagliptin dose not require renal dose adjustment for low eGFR. Dose reduction is required for other DPP4 inhibitors. dAvoid sulfonylurea in patients with advanced CKD due to risk of hypoglycemia. eThiazolidinediones should be avoided in patients with a risk of heart failure; monitor for sodium-water retention. fSGLT2 inhibitors are not recommended if the eGFR is <45 ml/min per 1.73 m2. gInsulin may be used as initial therapy in selected patients who present with severe hyperglycemia or otherwise are not candidates for oral agents. ACE, angiotensin-converting enzyme; ARB, angiotensin-2 receptor blocker; HbA1c, glycated hemoglobin; MRA, mineralocorticoid receptor antagonist; RAS, renin-angiotensin system; UAE, urine albumin excretion. A 58-year-old woman was referred for evaluation of newly discovered proteinuria with declining eGFR. The patient has a history of type 2 diabetes and hypertension for 10 years. A retinal examination done 1 year before the visit showed evidence of nonproliferative diabetic retinopathy. Serologic evaluation for antinuclear antibody (ANA), anti-neutrophil cytoplasmic antibody (ANCA), complement, serum and urine protein electropheresis, anti-phospholipase A2 receptor antibody, rapid plasma reagin, HIV, and hepatitis C virus was negative. Often, a routine panel of serologies is obtained for patients with heavy proteinuria. Some of these can be averted due to low pretest probability (e.g., ANA) and lack of active urinary sediment (e.g., ANCA). In some circumstances, other tests may be indicated, such as a drug intoxication screen, rheumatoid factor, anti-cyclic citrullinated peptide antibody, Scl70, anticentromere, Sjogren's syndrome A and B antibodies, etc. This patient is hepatitis B surface antigen and hepatitis B core antibody positive. All other laboratory tests were not contributory. Her medications were aspirin 81 mg daily, metformin ER 1000 mg daily, lisinopril 40 mg twice a day, nifedipine 30 mg daily, furosemide 20 mg daily, and atorvastatin 80 mg daily. Physical examination revealed that BP was 139/75, pulse was 82, weight was 85 kg, and body mass index was 33. Other physical examination features, apart from leg edema, are unremarkable. There was no clinical evidence of congestive heart failure or peripheral vascular disease. Laboratory evaluation revealed BUN of 23 mg/dl, serum creatinine of 1.8 mg/dl, and eGFR was 30 ml/min per 1.73 m2. A random serum glucose was 190 mg/dl, and her glycated hemoglobin (HbA1c) was 9.0%. Electrolytes and liver function tests were normal. Hepatitis B virus (HBV) DNA was 505 IU/ml. Urine analysis showed specific gravity 1.015, pH 6.0, 3+ protein, 1+ blood, white blood cell 3, and red blood cell 10. A 24-hour urine collection revealed urinary albumin excretion (UAE) rate of 2500 mg/d. There was no prior UAE measurement for comparison. When is a renal biopsy indicated in patients with type 2 diabetes? The term DKD is used for patients with a presumptive diagnosis of kidney disease caused by diabetes; diabetic glomerulosclerosis is a histopathologic descriptor. DKD encompasses the spectrum of vascular, glomerular, and tubulointerstitial components of diabetes-induced kidney disease. Most patients with type 2 diabetes do not need a renal biopsy to establish DKD. The diagnosis is usually on the basis of a clinical composite of persistently high UAE in a patient with diabetes duration >7–10 years who has at least background diabetic retinopathy and whose urinalysis is relatively bland. Hematuria may be present, but urine sediment is usually unremarkable apart from some occasional erythrocytes. eGFR is usually decreased. In some patients with DKD, the combination of low eGFR and normoalbuminuria is noted even in the absence of prescribed RAS blockers (1). Diabetic retinopathy is highly concordant with DKD in patients with type 1 diabetes, but only 50%–60% of patients with type 2 diabetes and DKD have retinopathy (2). Other diabetic complications are also frequently present, including diffuse vascular disease involving coronary, cerebral, and/or peripheral vascular beds. Kidney biopsy indications vary among nephrologists. In a retrospective sample of 233 patients with diabetes who underwent a kidney biopsy, 53.2% had evidence of non-DKD (3). Similar studies of biopsies of patients with type 2 diabetes showed a high prevalence of non-DKD (4,5). However, selection bias is inherent in these retrospective studies, because these patients had atypical presentations. Although a clinical DKD diagnosis is appropriate in most patients with classic presentations, maintaining clinical suspicion for non-DKD is necessary, especially in patients with diabetes with atypical features, such as sudden onset of severe proteinuria, short diabetes duration, rapid eGFR deterioration, active urine sediment, very high proteinuria, absence of expected diabetic comorbidities, and/or concurrent systemic disease. In the case presented, although the patient’s history of type 2 diabetes mellitus, hypertension, retinopathy, and nonactive urinary sediment suggested DKD, her history of HBV antigen carrier status together with newly discovered severe proteinuria and the rapidly declining eGFR raised the possibility of a non-DKD, such as secondary membranous nephropathy. Without a kidney biopsy, the patient did not meet HBV treatment criteria. However, if the biopsy showed histopathology that was likely to be secondary to her HBV, disease-specific therapy might alter the course of her liver and kidney disease. The patient’s ultrasound showed right kidney 9.7 cm and left kidney 10.2 cm, with increased echogenicity and without obstruction, stones, or masses. Light microscopy showed diffuse mesangial expansion consistent with diabetic glomerulosclerosis and arteriolar nephrosclerosis. There was 20% interstitial fibrosis and tubular atrophy. Immunofluorescence microscopy showed the anticipated pseudolinear albumin and IgG along the glomerular capillary wall. Electron microscopy showed thickened basement membranes and expanded mesangial matrix without deposits. There was no evidence of hepatitis B–associated kidney disease. What is the best next step for the treatment of hyperglycemia? Optimal glycemic control lowers the risk of microvascular and macrovascular complications in patients with type 2 diabetes (6). Antihyperglycemic therapy choice is highly individualized. Each drug class has unique advantages and disadvantages. For patients with CKD stage 3 or higher, there is an increased risk for hypoglycemia and lower likelihood of improving hard end points by strict glycemic control, and therefore, it is reasonable to take a more liberal approach (7). In these patients, the HbA1c goal may be set higher (e.g., <8.0%) than the usual 7.0% target for patients with new-onset diabetes and those with fewer diabetic end organ complications. The patient was taking metformin, which is considered the best first-line oral drug for patients with type 2 diabetes and normal kidney function because of its low cost and beneficial all-cause and cardiovascular mortality effects (8). It carries a low risk of hypoglycemia and has weight-lowering properties. Metformin use in patients with CKD stage 3 or higher is more controversial due to the risk of lactic acidosis. A recent systematic review did not show evidence for increased lactic acidosis risk, even in patients with eGFR<30 ml/min per 1.73 m2 (9). The revised package now recommends using eGFR to determine whether a patient should receive metformin, replacing the single-serum creatinine concentration suggested previously. The new labeling indicates that metformin should not be prescribed for patients with eGFR<30 ml/min per 1.73 m2 and should not be started in patients with eGFR<45 ml/min per 1.73 m2. In stable patients who started metformin while their eGFR was above 45 ml/min per 1.73 m2, it may be continued with lower dose adjustment and careful monitoring as function declines. In the patient presented, metformin should be stopped, because the patient has an eGFR of 30 ml/min per 1.73 m2 and is at risk of worsening kidney function. Alternative medications, such as a metiglinide (e.g., nateglinide) or a thiazolidinedione (i.e., pioglitazone), may be substituted for metformin in patients with CKD stages 3–5 (Figure 1). Thiazolidinediones should be avoided in patients with congestive heart failure risk. A sulfonylurea (e.g., glipizide) is a low-cost alternative frequently used in clinical practice, but it carries a higher risk of hypoglycemia in advanced CKD stages. The dipeptidyl peptidase-4 inhibitors are a newer class of antihyperglycemic therapy. These drugs reduce UAE, possibly by reducing HbA1c and BP, but studies so far have failed to show additional cardiovascular benefits. Some, such as linagliptin, require no dose adjustment, even in patients with low eGFR. The glucagon-like peptide-1 receptor agonists (GLP1-RAs) are also reasonable add-on therapies for glycemic control. Studies on the cardiovascular effects of this class of medications have been published or are in progress. The Liraglutide Effect and Action in Diabetes: Evaluation of Cardiovascular Outcome Results (LEADER) trial reported a 22% reduction in cardiovascular death and 15% reduction in death from any cause in patients with type 2 diabetes on liraglutide compared with placebo (10). Similar results were obtained for semaglutide in the Trial to Evaluate Cardiovascular and Other Long-term Outcomes with Semaglutide in Subjects with Type 2 Diabetes (SUSTAIN-6) study (11). Patients in the semaglutide group had higher retinopathy complications than patients in the placebo group. Liraglutide is currently Food and Drug Administration (FDA)–approved; semaglutide is under review. Randomized trials targeting cardiovascular outcomes of other GLP1-RAs are in process. In an obese patient with CKD stage 3 and suboptimal glycemic control, such as in the patient discussed, GLP1-RAs can improve glycemic control and BP, reduce albuminuria, and lower cardiovascular risk. Some have simple dosing regimens of once weekly injection without titration and do not require dose adjustment for low eGFR. This could be an advantage, especially in patients with high pill burden. There is a black box warning for medullary thyroid carcinoma and multiple endocrine neoplasia syndrome type 2 due to dose-related and duration-dependent increased incidence of these tumors in rodents; human relevance is unknown. Current pricing is high, and access is often restricted. Another class of agents, the sodium glucose cotransporter-2 (SGLT2) inhibitors, would not be an option in this patient. Their efficacy is reduced and toxicity is more likely in patients with an eGFR<45 ml/min per 1.73 m2. However, in patients with no or minimally reduced eGFR, the SGLT2 inhibitors lower glucose, BP, and body weight and improve cardiovascular and kidney outcomes. The Empagliflozin Cardiovascular Outcome Event Trial in Type 2 Diabetes Mellitus Patients (EMPA-REG OUTCOME) trial reported a 14% reduction in the primary composite outcome of cardiovascular death, nonfatal myocardial infarction, and nonfatal stroke and >30% reduction in cardiovascular death, hospitalization for heart failure, and death from any cause (12). There was also a 39% reduction in incident or worsening kidney disease, which included serum creatinine doubling and kidney replacement therapy. Similarly, the recently published Canagliflozin Cardiovascular Assessment Study (CANVAS) and CANVAS-Renal Trial showed that canagliflozin reduced cardiovascular events by 14% and lowered the rate of eGFR decline by 40% in patients with type 2 diabetes and a high risk of cardiovascular disease. The most significant adverse effect was a nearly twofold risk of lower limb amputations in the canagliflozin group compared with placebo (13). The FDA issued a new safety communication concerning an increased risk of leg and foot amputations associated with canagliflozin use, and a boxed warning will be added to the label. SGLT2 inhibitors have also been associated with genital yeast infections, urinary tract infections, and euglycemic ketoacidosis. In patients with type 2 diabetes presenting with very high blood glucose and HbA1c levels and those who have contraindications to metformin or are poor candidates for oral agents, insulin can be used as first-line pharmacotherapy along with lifestyle management. Furthermore, there is some evidence that earlier use of insulin may improve overall diabetes control and help preserve endogenous insulin synthesis. Because insulin is largely eliminated by the kidneys, patients with diabetes and declining eGFR who use insulin should have blood glucose monitored closely to minimize hypoglycemia risk. The patient is on a maximum dose of an ACE inhibitor. What additional pharmacotherapy can be given to further regress albuminuria and improve outcome? Patients with type 2 diabetes and increased albuminuria are at high risk of progressing to ESRD or succumbing to cardiovascular disease. RAS blockers, such as ACE inhibitors and ARBs, may not adequately regress albuminuria and preserve kidney function in a considerable proportion of patients with DKD, such as in our patient. Combination therapy with an ACE inhibitor and an ARB or an RAS blocker with a direct renin inhibitor (aliskiren) may further reduce proteinuria, but large trials failed to show improved clinical outcome; rather, there was a trend toward an increase in hyperkalemia, the development of kidney failure, and possibly, increased mortality with these combinations (14). Thus, it is important to keep in mind that albuminuria reduction and clinical outcome are not necessarily concordant. Even so, serial measurement of albuminuria after maximum treatment with an RAS blocker is useful in identifying patients at high risk of progressive kidney function decline. Plasma aldosterone levels are more elevated in a subset of patients after initiation of ACE inhibitor or ARB therapy. This is called aldosterone breakthrough, and it is thought to be due to increased renin; however, the exact mechanism is not known. The incidence of aldosterone breakthrough may range from 40% to 53%. Patients with aldosterone breakthrough may lose kidney function faster (median of −5.0 ml/min per year) than those without it (median of −2.4 ml/min per year) (15). Evidence to support widespread screening for aldosterone breakthrough is not very strong. However, in patients with DKD suspected of aldosterone breakthrough, aldosterone blockade using spironolactone or eplerenone with close monitoring of serum potassium levels has an additive effect on reducing proteinuria when combined with an ACE inhibitor or an ARB, although definitive evidence that this will improve kidney outcome or patient survival is lacking. The risk of hyperkalemia occasionally limits the use of RAS blockers, especially in patients with diabetes and renal tubular acidosis. Hyperkalemia also frequently limits the use of combined MRA with ACE inhibitors or ARBs, especially in patients with reduced GFR. Novel MRAs, including finerenone (a nonsteroidal MRA with greater receptor selectivity and affinity compared with steroidal MRAs, such as spironolactone and eplerenone), have been shown to improve albuminuiria in DKD when added to an ACE inhibitor or an ARB, with a low incidence of hyperkalemia. Phase 3 trials of finerenone are currently underway. In addition to diuretics, resins for chronic use that lower serum potassium can reduce the incidence of hyperkalemia. Patiromer is available in the United States; both patiromer and zirconium silicate are available in Europe. It remains to be determined if aggressive use of resins will enhance the therapeutic effect of RAS blockade while modulating hyperkalemia. For Bayer and the Finerenone studies, S.G.A. is a site principal investigator and on the steering committee. For Lilly Pharmaceuticals and the phase 2 study of LY3009104 in patients with DKD (JAGQ) Study, S.G.A is a site principal investigator and on the steering committee.